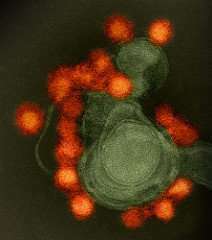 A type of immune cell that produces a protein called CD4 plays an important role in protecting mice infected with the Zika virus against severe neurological disease, according to a study published September 6 in the open-access journal PLOS Pathogens by Amelia Kahler Pinto of Saint Louis University, and colleagues. Based on the findings, vaccines that induce strong responses from these immune cells, known as CD4+T cells, should be developed to prevent invasion of the Zika virus into the brain and spinal cord. The Zika virus is a mosquito-borne virus that has recently spread throughout the Americas and the Caribbean. In some cases, Zika infection during pregnancy causes severe birth defects such as microencephaly—a condition in which a baby's head is smaller than expected. Infection with the virus can also cause neurological disease in adults. With growing awareness of the increased risk of severe neurological problems associated with Zika virus infection, focus has shifted toward detection, defining correlates of protection, and the development of a vaccine or antiviral to protect against disease progression. However, efforts focused on prevention and treatment have been limited by the lack of knowledge about how to generate a protective immune response against this emerging pathogen. To address this gap in knowledge, Pinto and colleagues investigated the role of CD4+T cells in protecting against Zika virus disease affecting the nervous system using a mouse model of infection. Mice lacking CD4+T cells showed more severe neurological symptoms such as limb paralysis and whole-body tremors, increased mortality, and significant increases in viral concentrations in the central nervous system (i.e., the brain and spinal cord). Moreover, the transfer of CD4+T cells from Zika-immunized mice protected susceptible mice from a potentially lethal dose of the virus. The findings suggest that the CD4+T cell response is necessary and sufficient for control of Zika virus disease. "The study reveals a novel role for CD4+T cells in providing protection against Zika virus infection and highlights the need for vaccines that elicit robust CD4+T cell responses to control viral replication within the central nervous system and prevent the exacerbation of severe neurological disease," Pinto said.